The Newest Rant: Marvel is Re-Launching...Again. Meh. 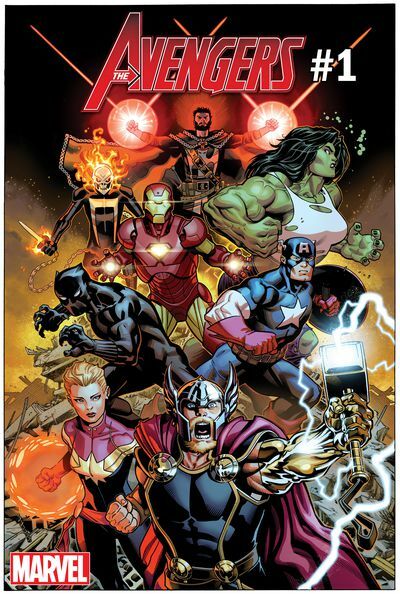 Hey you, remember how not too long ago Marvel had that big, "Marvel Legacy," re-launch that was an utter mess to make sense of between confusing, "Legacy numbering," and stupid cover-ordering schemes? Well, Marvel feels it is time for yet another, "Fresh Start," and now Marvel will have basically done seven re-launches in the past five years. So, yeah, that's a thing that is now happening. Honestly, I'll probably just read the small number of Marvel titles I still enjoy as long as they aren't cancelled/too heavily retooled and completely ignore any supposed big-deal events or story-lines coming from this latest desperate attempt to boost sales. Right now details are minimal outside of how we will be getting more #1 issues such with, "Avengers," which will apparently be condensed down to one book as opposed to a whole bunch of Avengers-related titles like we've had at times. The one thing about this news that pleases me? In the above promo image you clearly can see one of the Ghost Riders somewhat prominently featured, which adds fuel to the fire of the rumor I shared that Marvel has big plans for the character of Ghost Rider (and the various human avatars that have possessed it) in the near future. That just makes me happy to see that some scuttlebutt I was told could be truthful and not just empty bragging/drunken ranting from the people I harass for exciting news and rumors. Other than that however, this news just makes me shrug indifferently. It's funny to think how Marvel's movies are just doing gangbusters right now, and the comics are essentially stagnating. I mean, it's funny in a really depressing way, not ha-ha funny.